Alloy Wheels Direct is one of the UK’s most established suppliers of new and replacement TPMS systems, supplying consumers and the trade with a comprehensive range of tyre pressure monitoring systems and sensors. Tyre pressure monitoring systems (also known as TPMS) are electronic sensors that monitor the pressure of your tyres and warn you when a tyre is deflating, or when a tyre is flat. Warnings may be in the form of a light on the dashboard or a more detailed display with tyre pressure readings for each wheel. Please scroll down for products. Alloy Wheels Direct supply trade customers and consumers with replacement TPMS sensors, valves, parts and service kits - our customers include tyre centres and garages. Most TPMS systems have a limited life span; as vehicles age it is not uncommon for pressure sensors to fail or need replacing. If you have a vehicle with a failing or problematic TPMS system and you are unsure which sensors you need, please give us a call or email us, we should be able to tell you which system or sensors are installed in the vehicle and supply replacements. Tyre pressure monitors first started to appear during the late 1980’s with prestige manufacturers like Porsche offering sensors as an optional extra on specific vehicles. As technology advanced and developed, and manufacturing costs reduced, more and more vehicle manufacturers began to adopt TPMS systems - offering them either as an option or as standard on their production vehicles. 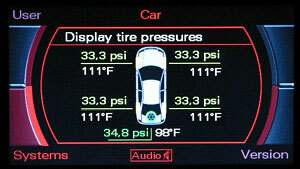 Tyre pressure is seen as such a critical safety issue in America, that TPMS has been made mandatory on all vehicles manufactured after November 2006. Since the 1st November 2012 TPMS systems have become compulsory on all newly designed vehicles in Europe and will be compulsory on all newly manufactured vehicles from 2014. Although there are many different models of TPMS monitors on the market, they usually work in similar ways; either using direct or indirect TPMS sensors. A third system, which is a hybrid of the two, also exists. Direct TPMS sensors are the most accurate, usually incorporating a special valve and an external sensor that monitors tyre pressure. Direct systems are much more accurate than indirect systems because they take into account factors like tyre temperature. A wireless signal is sent from the TPMS sensor on each wheel to the vehicle’s computer and the pressure is displayed on the dashboard, or a warning light illuminated. Indirect TPMS sensors usually work with the Anti Lock Braking system to monitor wheel speed and detect a decrease in wheel radius. As a tyre deflates, the wheel will turn faster compared to the other wheels and the system detects this. Indirect systems are much easier and cheaper for vehicle manufacturers to implement; however they are less accurate. 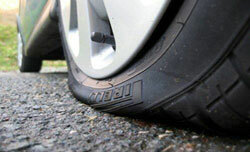 Tyre pressure is a critical factor in terms of vehicle handling and safety. Although people always fill up with petrol, and occasionally check their oil, many people fail to check their tyre pressures on a regular basis. A vehicle’s tyres are the only point of contact that it has with the road, and this area is a much smaller area than you might imagine - around the size of a dvd. If a tyre is over inflated then the area that is in contact with the road surface is reduced – affecting braking & steering performance, and causing uneven tyre wear. If a vehicle has under inflated tyres the tyre temperature increases, the tyre is more prone to failure, and the vehicle’s handling is adversely affected. 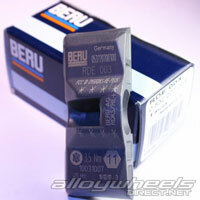 For more information tyre pressures, please see our tyre pressure page. By having a TPMS system installed in your vehicle you are able to continually monitor the pressure of the tyres and are alerted to any drop in pressure or a puncture. If you are unsure which system you need for your vehicle please contact us. We are only too happy to help.